Constructed by modular techniques `M` Range furnaces have an inner case `heat box` surrounded by an air gap with case ventilation fan. This double skin construction ensures that the furnace casing remains relatively cool even when working at high temperatures. 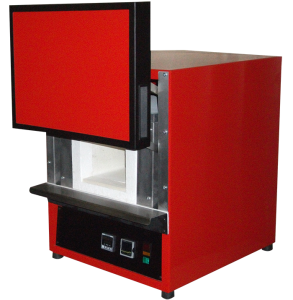 A range of well proven highly efficient muffle type furnaces incorporating features which combine the expertise of generations of furnace construction and design, together with the latest high technology, components, and techniques. The vertically lifting full width door affords obstruction free access to the work chamber and keeps the hot face away from the operator at all times. The door is spring counterbalanced and a polished stainless steel shelf is fitted below. Heating: The heating elements are high quality graded spiraled wire, carefully positioned and fixed in place around a hard wearing sillimanite muffle work chamber. The larger models, M7, M8 and M9 are fitted with ceramic tiles to form the chamber with the elements embedded in the side walls, and as an option in the top tile. Controls: The controls are below the furnace body and set an angle for ease of vision. A microprocessor based digital temperature controller with set-point and process displays, provides accurate fully automatic control. Controls include thermocouple break protection. Options include: alternative models of temperature controls / programmers / recorders / communications / timers / floor stands / chimneys / inert gas connections etc. Performance may alter due to mains voltage fluctuation and ambient temperatures etc.